Already a few weeks into autumn, and my work schedule combined with a few rainy weekend days had been keeping me away from the trails. The foliage was at its peak over the Columbus Day weekend, and I was in search of a canine to accompany me on a hike. 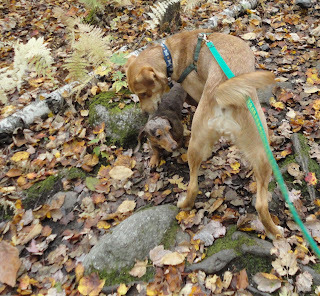 So, I was thrilled to receive an inquiry from Kenzi's foster family member Michaela who was also looking for a holiday weekend outing that would be suitable for her 10-month old foster dog Kenzi and her own 7-year old rescue dog Zeke. After several months of solo hiking one dog at a time, I was looking forward to a small group outing and the opportunity to further showcase the lovely Kenzi. It is shocking to me that this wonderful, young girl has been overlooked for several weeks now. 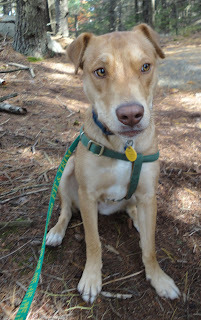 All along the Piper Mountain Trail, Kenzi was as pleasant and well-behaved as the first time I hiked with her to top of Mt. Major back in August. 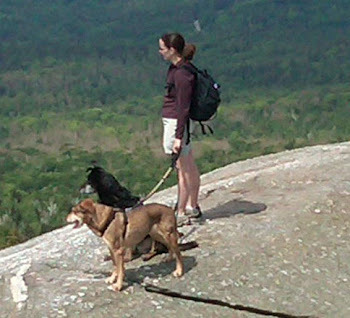 Kenzi and her foster brother Zeke were both extremely polite with everyone - human and canine - they met en route to the top of Piper Mountain (2,042 ft.). The 2-mile round trip out and back trek to this summit in the Belknap Mountain Range is the perfect fall hike when you are in search of big views but have little time to spend. As we walked along, I asked Michaela to tell me more about how Kenzi interacts with the other members of her foster family. 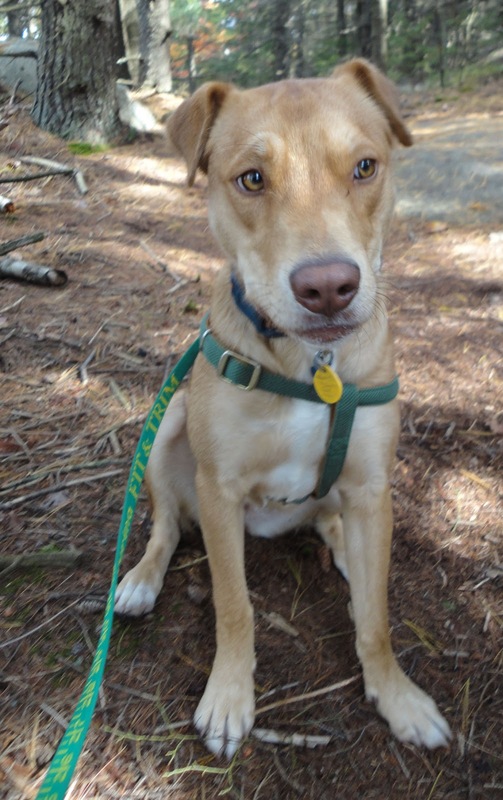 In short, Kenzi is the ideal guest who gets along with people and dogs of all ages. While the family does not include cats, Kenzi has not caused any trouble for the the bunny in the household. She is also fully house and crate trained. We are confident that the perfect family is out there waiting to welcome this well-trained girl with golden eyes and matching coat. To learn more about Kenzi and to complete an application to adopt her, please visit her profile online at Petfinder.com. From there, you can read more about the experiences in her foster home and also obtain more information about her rescue organization. If you are interested in becoming a foster home or would like to make a donation to support more dogs in need of rescue, please visit Canine Guardians for Life, Inc. to support their efforts with a contribution of time or treasure! 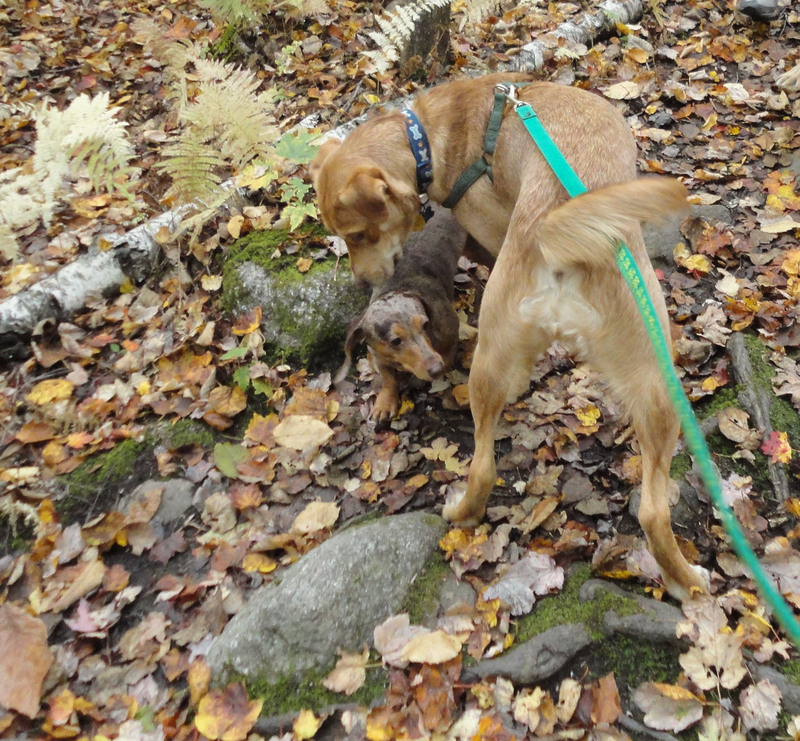 A full photo album of Kenzi and Zeke's hike is also available on the Foster Dog Summit facebook page.